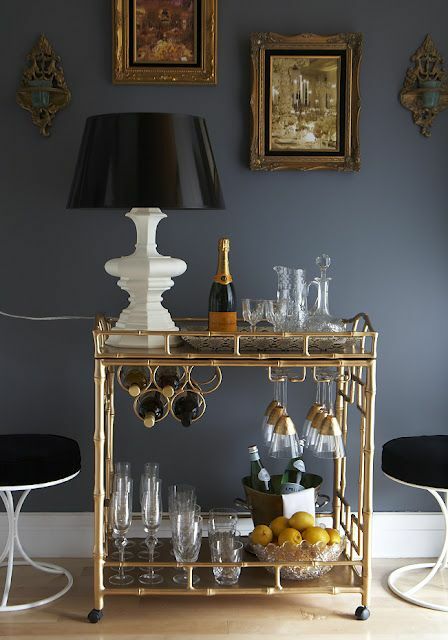 Bar carts truly make me so happy. They’re darling and usually filled with fun things. 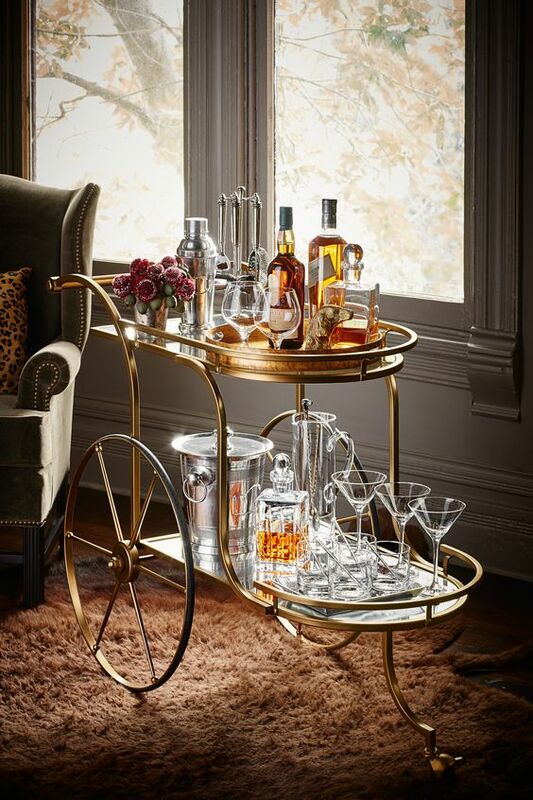 You can use it for what it’s intended for, a rolling cart filled with necessities for cheerful cocktails, or put it to work as a coffee cart, night stand, toiletry cart, the possibilities are endless. 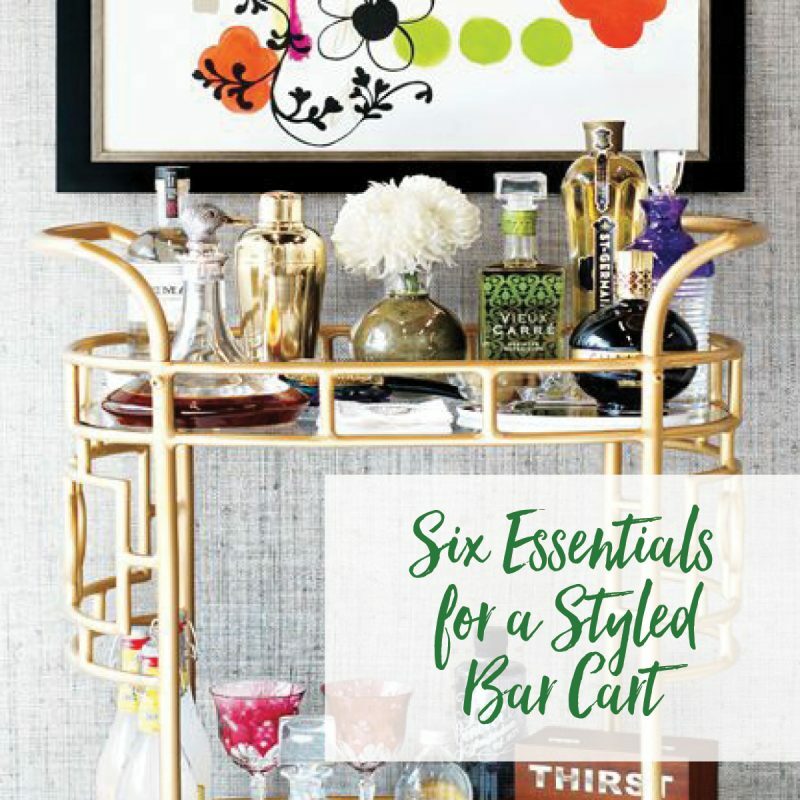 When styling a bar cart, I have found there are 6 must-haves and everything else icing on the cake. Whether it’s a pretty vase with fresh cut flowers, a cute pot with textured succulents, a green wreath hanging above or even a bowl of lemons and limes. 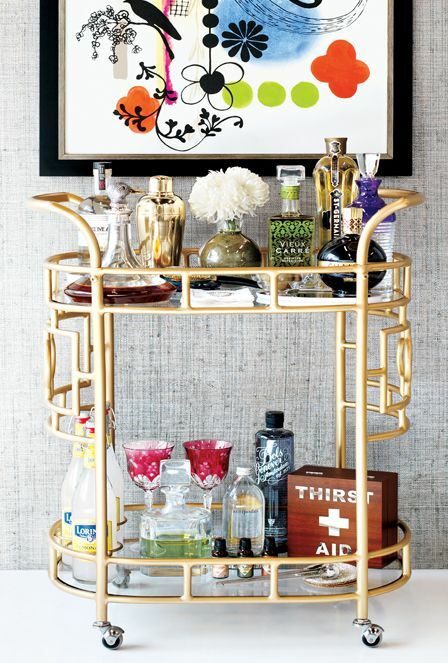 Adding a living element to your bar cart keeps it feeling fresh and bright. 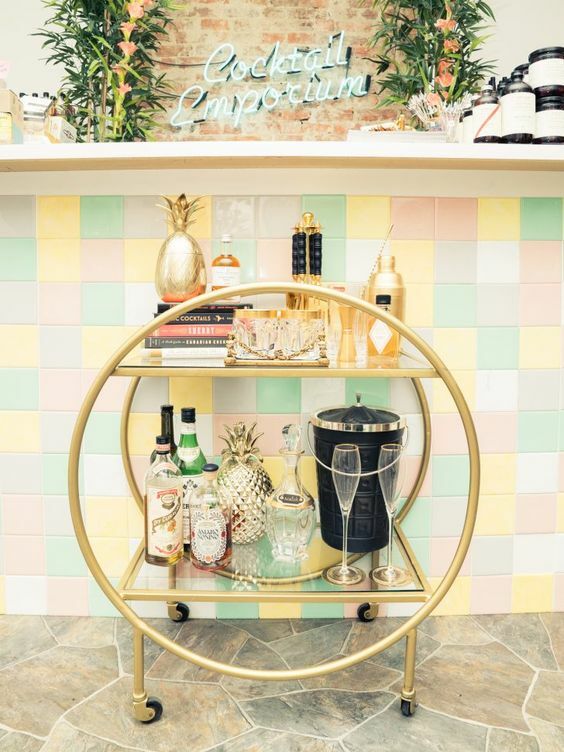 Adding light to the bar cart shows your guests it’s open for business and everyone’s welcome to stop over for a drink. Plus having a candle, or a pretty lamp, or dangling chandelier above makes all the pretty bottles and glasses sparkle in the evening. 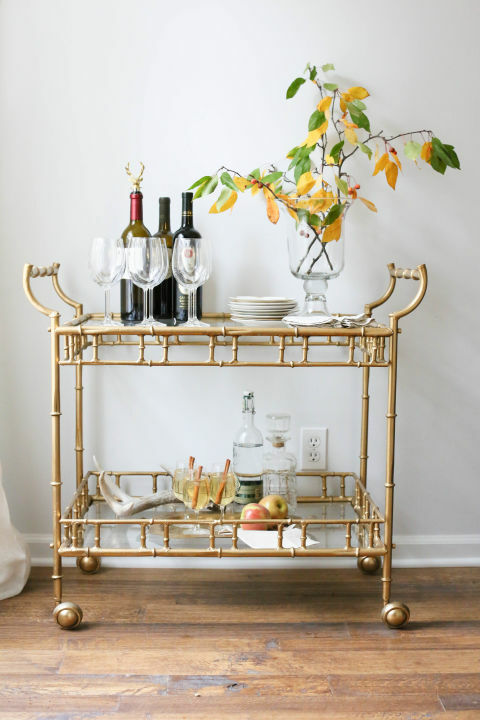 A rectangular or square piece of art hanging behind the cart, or a darling framed piece on the cart helps add a different shape and size to the cart. Since most of the bottles and glasses will most likely be round adding a square or rectangle helps balance the other elements. Even a stack of cool coffee table books could be your art element. 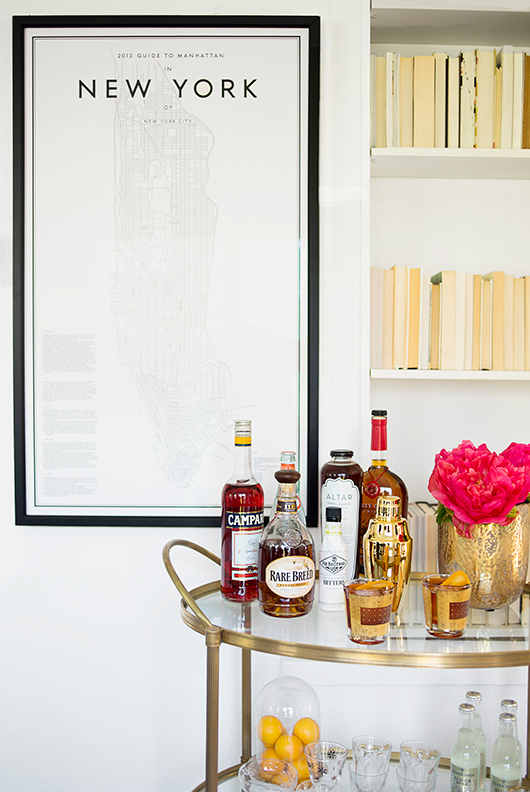 BEAUTIFUL BOTTLES OF YOU KNOW WHAT…BOOZE. Can’t forget the guest of honor of course, the bottles that allow the bar cart to do its job. Of course you’re welcome to stock the cart with the beverages you know you love, but what’s more fun than looking for unique and creative bottles in special shapes and well-designed labels. I like to keep it simple, and for lack of space, with two maybe three styles of glassware. A good rule of thumb is 4 glasses of each style; you can always have a backup tray of additional glasses nearby. A champagne flute or tall wine glass, a highball and a lowball is all you need. If you have it, a coupe glass is always darling too. Stirrers, olive picks, straws, a shaker, an ice bucket, any of these will do. Pick your favorite tool based on look or what you know you’ll use. These are just fun accessories to add to your cart of fun. I really like how you incorporated the photos of the rolling carts into your article. It helped inspire me to include a rolling cart in my basement next to my bar table. I need to find some new wheels for the rolling cart I already have so that it functionally rolls without any problems.